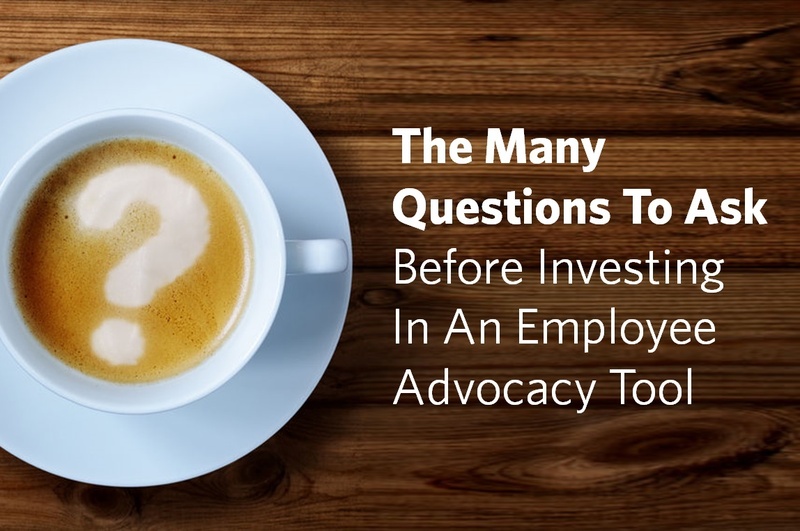 This is my third and final post in a series around employee advocacy tools. The first addressed 19 employee advocacy tools worth checking out, the second went on to list 7 smart employee advocacy features that could save both time and money. If you're a little further down the line with employee advocacy and already talking to a number of vendors then perhaps this post is for you. I've listed and categorised questions (and there are many) that you should ask about from user interface and tool functionality through to data protection and compliance. Let me know if you feel something should be added. I'm more than happy to extend the list as we learn from experience. Can employees easily use the application via mobile and tablet devices? Which languages does the tool support? Do employees have the ability to customise posts before publishing? How do users add content to the platform? Do they have to log in and copy/paste a URL into the system or can they install a Chrome Extension where they can suggest content via their browsing experience? Can employees set up an auto-schedule feature so they can build a backlog of posts to share within the tool? How are incentives (if any) awarded? Third party reward company ? How do we ensure that we comply with local employee incentive/award legislations? Is it possible to alter the reward mechanism so we provide incentives on engagements or clicks generated, not just posts shared? How do we extend the advocacy tool out to business partners and perhaps even customers? What happens to the data should we terminate the contract? How long would it typically take to launch the program to a small pilot group? What kind of internal communication plan would you advise we put together? What invitation/registration ratio should we expect? How many administrators can manage the tool? Can we alter the permissions of different administrators within the tool? What reporting capabilities do you have within the platform? Can we customise report layouts? Can we set up reports to be emailed on a daily/weekly/monthly basis? Are we able to export the raw data to extract further value? How do we identify our top influencers generating the most engagement? How do we calculate the Earned Media Value of employee shares? Is there AI learning capability built-in so the tool learns from the content shared and only pulls in relevant content going forward? How do we feed content into the tool via internal sources? How can we categorise content within the platform? How can we categorise our users? Can we pre-categorise users before we invite them to the platform? Can we prioritise content within the tool so that highlighted content features towards the top of an individual employees dashboard? What processes/workflows are in place for content approval within the tool? Can we archive content after a set period of time? Can we set that period of time? What experience do you have in highly regulated industries around content workflows/processes? Can we distribute and allow employees to interact with internal only content via the tool? What language filters can we set up within the system so that translated articles are only made available to specific country users? Can we set up triggers and alerts around keywords to notify us when users submit content that does not comply with our policies? What’s your policy around employee data protection? Can we have different user agreements for different countries where employee contracts are different? Do you have single sign-on integration? How does the tool integrate with CRM tools? How does the tool integrate with marketing automation tools? What training do you provide around the tool? Do you have a local team in my country that I can talk to if needed? How do we handle end-user queries e.g. log-in issues? Do you have a help desk they can directly contact? Do you have a reference customer in my industry that I can speak to? We would like to run a 3 month pilot – is this possible? How do we keep employees engaged within the platform? Related Posts: 19 employee advocacy tools worth checking out and 7 smart employee advocacy features that could save both time and money.